BEHIND BLUESBetts snaps through a behind on the siren and the Suns take home the four points! Carlton's season is effectively over! Shattering for Carlton and its supporters. BEHIND BLUESEllard gathers and snaps at goal from close range but misses too! Margin stands at 13 and the Blues are running out of time. BEHIND BLUESEllard uses his body to take a solid grab and then fires the pass to Casboult inside 50 and he marks but doesn't play on. He sprays his shot wide from 45 and that hurts big time. BEHIND BLUESAnother wasted opportunity for the Blues as Betts steals possession but misses the shot at goal. 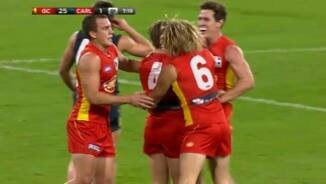 GOAL SUNSBennell over the top to Ablett and he pumps the pass to Brown who marks deep in the pocket. Brown passes across the ground to Lynch who plays on and goals! Could that be it!? BEHIND BLUESMurphy hits the kick toward goal but it is knocked over for the one behind. Margin is 10 points. Season on the line for the Blues and time is now an issue as we are down to the last seven minutes. A huge upset brewing. McKenzie is awarded the downfield free kick and will go back and line up from about 55 out on the right half forward flank. Out on the full. The Suns are playing like this is their Grand Finaldesperately trying to hang on and currently doing just enough. The fans are on the edge of their seats. GOAL SUNSWhite, in a one-on-one contest deep in defence, gives it up to Caddy who breaks the tackle and from 45, dribbles it along the ground for a lovely goal! Suns by 11! BEHIND SUNSAblett swings the shot at goal as he roves the footy off hands but bounces it over the line for a behind. GOAL BLUESMcLean angles his kick to the hot spot and Waite on the lead clunks the chest grab. Vital goal. From 15 out, he goes BANG! Here we go! The Suns are up against the ropes now. BEHIND BLUESCasboult receives the handball but is off balance as he shoots at goal and registers a behind. Blues draw closer. GOAL BLUESCasboult wobbles the pass inside 50 and the kick fortuitously finds Yarran out in front. He nails the goal from 40 and the margin is now under two goals! Anyone's ball game. BEHIND BLUESYarran takes possession in the middle and drives the kick inside attacking 50 to Casboult - all ignited by Judd in defence. Casboult drags it right from 45. Game on the line for the Blues right now. If they concede the next goal then it may be lights out. 15 minutes of game time to go. GOAL SUNSLynch on the lead brings down a strong grab and can give the Suns some breathing space from 35 out on a 35 degree angle. The Suns strike first! They lead by 18 points. Final quarter underway and the Blues have done enough to be in a position to win this match. They simply must. Or can the Suns hang on? Carrazzo marks just after the siren and won't be allowed to take his shot, but the Blues have stormed back in the contest and trail by two goals at 3QT. They hold the momentum. GOAL BLUESThe ball spills out to Waite who takes the ball in stride, fires a low shot at goal from 45 out hard up against the boundary line and rolls it home! Awesome! Blues within two goals! BEHIND SUNSDixon heads wide to Stanley and poor checking from the Blues as Stanely hits Hawsley 45 out. He drives it across the face - one behind. GOAL BLUESMcLean leads to take the grab 45m out on a tough angle in the left pocket. He fancies his chances and from the paint, he unloads a sublime shot for his second! Here they come again! GOAL SUNSThe Suns get their first of the quarter as Ablett collects the ball hard up against the boundary, handballs it over the top to Caddy who snaps it across his body and bounces it home! BEHIND SUNSAblett almost with a miracle goal off the deck from 15 out but it is wide for one behind. GOAL BLUESBetts on the lead spills the mark but regathers and dishes it out ot McLean who steadies and from 40 out on the burst, threads through the goal! Yes, they are truly back! Margin is 16! 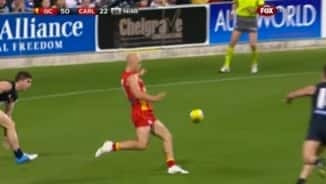 BEHIND BLUESGibbs sets the kick up in front of Waite and a late call by the umpire downfield says he was impeded and I believe that was the right call. Another behind! BEHIND BLUESScotland launches a long bomb at goal on the run from 50 but sprays it wide right. Margin is 29 points. If the Blues are to win tonight, they probably need to be within four goals come three quarter time, one would think. If the Blues fail to win this match you can certainly imagine the repercussions it may have on coach Brett Ratten. BEHIND SUNSA costly behind to Bennell on the run as he was in acres of space and could have really hurt the Blues on the break. The Blues are dominating this quarter but have scored just the one goal from five scoring shots. I can sense a comeback. GOAL BLUESBetts puts it out in front of McLean who gathers and bends the kick to a running Yarran who could of played on but decides against it. He goes back and slots it! Finally. Suns by 29. BEHIND SUNSDixon on a strong lead takes the mark 45 out on a tight angle. Energy sapping for the Blues if he kicks this. He doesn't. BEHIND BLUESWaite drives the kick in to the left forward pocket and Casboult leads to take the grab. He runs around and off a couple of steps, strikes the post! They keep on missing! BEHIND BLUESYarran drops the mark, regathers and then steers the pass in to the arms of Betts in the right pocket. On a 60 degree angle but just 15m out, he misses too! Shocking. BEHIND BLUESAnother minor score to the Blues as Judd receives the handball and drives through a behind on the run from 40. Costly. BEHIND BLUESKreuzer bombs the kick forward out of the centre and Waite protects the drop zone and takes the juggling mark. From 30 out, he drags it wide. A fivegoal to two second quarter in favour of the Suns and they hold a stunning 38-point lead at half time and the Blues are in one massive hole. 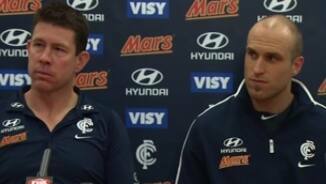 I would not want to be in the Carlton rooms now. Gibbs punches the short pass to Armfield who must goal from 45 out with little angle to speak of. No score. My oh my. Their confidence is shot. BEHIND BLUESWaite wins the free for a block out of the marking contest but misses to the near side from tight up against the boundary. BEHIND BLUESGarlett fires a shot at goal across his body but it sails wide for a behind. Not good enough. BEHIND SUNSA minor score to May from outside 50 and the Suns lead by 40 points. GOAL SUNSA dubious free against Duigan for front on contact on Dixon - a courageous contest from both players and it should have been play on. Both players jog off. Brown takes the free. GOAL! GOAL BLUESGarlett has found space inside 50 and he stretches to pluck the grab 35m out directly in front. He steers home the major and it was an understatement to say they needed that! The Blues don't deserve to play finals if they serve up this kind of football and they won't be playing come September if they don't pull their foot out of you know where. GOAL SUNSGillbee earns himself the free for a hold and quickly snaps it in to the goal-square to find Dixon. Dixon can't miss from point-blank-range and the margin is now 39 points! BEHIND BLUESSimpson fires at goal from 45 on the run but has the shot punched over for a minor score. GOAL SUNSAblett with a lace-out pass to Dixon who marks hard up against the boundary line 50 out. 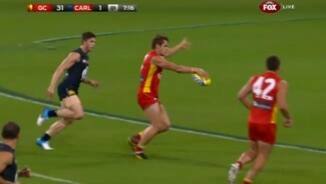 He sends the kick to the square, Kreuzer looked to have marked, it falls to Caddy who goals! McLean heads wide inside 50 and Garlett dives to take the chest grab. He in turn shorts the pass deeper in to the left pocket to Simpson. Simpson, from 25, fails to score. 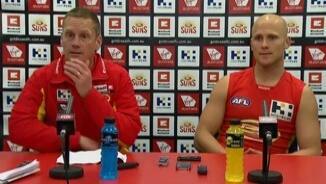 GOAL SUNSIs there nothing Ablett can't do!? Matera hands out to the Little Master who gathers on the bounce, turns on to his right boot and bends home an incredible goal from 45 out! GOAL SUNSHorsely intercepts the Tuohy kick-in and makes the Blues pay as he slots the major from 40 out and extends the home side's lead to 22 points. Another Carlton turn over. BEHIND SUNSBell tries to take the game on deep in defence and is run down by Magin. Magin lines up from tight in the pocket and pushes it across the face. GOAL BLUESWalker drives the pass to the danger spot and Betts works his opponent out of the contest and takes the grab as he falls to ground. He pops it home from 10m out and the Blues are back. BEHIND BLUESWaite works the kick in to the right pocket and Casboult eases his opponent under the ball and takes the grab. He hangs his shot out right. Second quarter underway and after the Suns banged home the first 5 goals of the match, the Blues slowly worked their way back. McInnes is gone for the game (knee injury) and Ellard was activated. BEHIND BLUESYarran gets on the end of a long centered pass inside the Blues' attacking 50 and will line up for goal after the siren. From 45, he hits it well wide to the right. Suns lead by 22. GOAL BLUESSome Kreuzer magic as he taps it down in to Judd's path once again from the boundary throw in and Judd runs in and knocks home his and Carlton's second major. GOAL BLUESFinally, the Blues break the drough as Kreuzer taps it down brilliantly to Judd from the ruck contest and the Carlton skipper gets things started from 35 on the run. About time. BEHIND BLUESJudd hands back to Yarran who has a shot from 45 out and he is off line to the left. The Blues are second to the ball and the Suns are doing as they please at the moment. 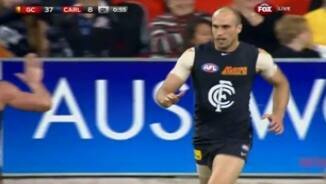 Carlton really need to get a move on. GOAL SUNSStanley marks in the middle and hands off to a running Weller who unwinds from just outside the paint and it sails right through for the Suns' fifth major! Blues are stunned! GOAL SUNSMcKenzie marks at CHF and plays on quickly, he heads to the hot spot, it flies over the pack and bounces through for another major! Amazing! Suns lead by 24 points! All three of Gold Coast's goals have come from Carlton turnovers who have a 48% efficiency rate by footthey are basically butchering the ball. The Blues are a big chance of playing finals remember, but first things first, they must win tonight. BEHIND SUNSA downfield free to the Suns as Gillbee is pushed after his kick and Brown will line up from 40 out on a 60 degree angle. He hits it across the face. GOAL SUNSFlanagan shorts the pass across the ground to Lynch who can line up from the same spot as where he booted his first goal. A beautiful kick and the exact same result! What a start! GOAL SUNSMay hands off to Hickey who glides a low shot at the sticks from outside the arc and it slides home for a brilliant goal. A surprisingly good start by the Suns. BEHIND BLUESSimpson chips the pass to Waite who marks 40m out on a 45 degree angle in the right pocket. He starts the kick left and it stays left. GOAL SUNSLynch on the lead takes the mark as McInnes, Lynch's direct opponent, is assisted from the ground looking a little worse for wear. From just inside 50, he drills the opening goal! The Blues need a big percentage booster here this evening and then a favour from North Melbourne tomorrow afternoon if they are to keep their finals dreams alive. Here we go! Welcome to Metricon Stadium for the clash between the Suns and Blues. One late change for the Suns as Taylor is replaced by Toy. The Blues are as selected. The subs: Josh Toy and David Ellard.